Still love to make them, they still make me smile and tickle me beyond belief. Having no major project on my needles does not make me lust any less over yarn though! Come on let’s take a look what yarn I have taken home with me, simply because I could not resist. 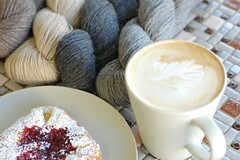 A good latte, a danish pastry and some Eco Alpaca, 100% Undyed Baby Alpaca…purr purr! I am thinking a nice cardi come wintertime! Hmmm hmmm, how delicious. I have no clue what I am going to make with it. All I know is that this colorway simply rocks my world. 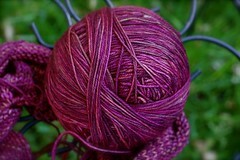 Also delicious is Malabrigo’s sockyarn. 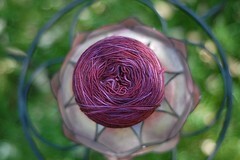 Sally bought some skeins and let me tell you, it simply flew out of the yarnshop! So soft and silky feeling…meow! Say what? You didn’t get yourself some? Eh…what can I say? You snooze, you lose! Ah…that magical thread called yarn. I will always keep on lusting over it. 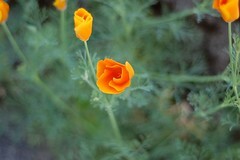 Lately, I have been spending time with my Nikon DSLR D40 again. Just like when I was a newbie knitter, this newbie amateur photographer is soaking up all the knowledge she can get her hands on! It’s a steep learning curve for sure, but I am having lots of fun! 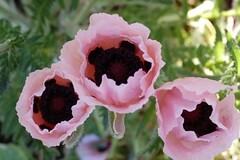 Yesterday, I let my poppies pose for me, luckily they were willing subjects. Cute. I like. But I want the background more blurry! Silky and Smooth green background! What to do, what to do? Yay! I am finally getting it! And now that I have figured out how to do that smooth and silky background, I of course am obsessed with it! 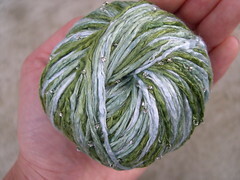 I had heard about this fairly new yarnshop in Manzanita at the Oregon Coast and of course I had to go visit last week! It was a sweet find and I had such a nice talk with the owner Olga. She just made my day with her sweet and uplifting energy. 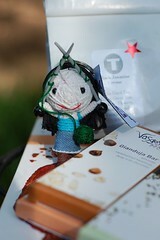 Some loose leaf tea, several bars of delicious out of this world chocolate, and a superpower stringdoll called Purl. Again, more about Olga and T-spot in a later post! Me and my husband spent a few days at the Oregon Coast to celebrate our 4th anniversary. 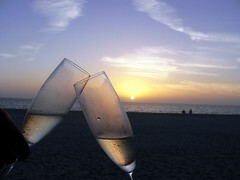 We had a fantastic time in which we shared many romantic moments and reminisced past anniversaries. What struck me the most though, is how at peace I am with myself. And while dreaming away in front of the Pacific Ocean, I remembered a time where confusion and pain had nestled in my being. 8 years ago, in the year 2001, I believed I was on a good path and riding a high and mighty wave; I had just made promotion within the company which had employed me only several months before, I was making great progress in my Economics Studies, my paycheck was so fat I hardly could believe it and me and the boyfriend had decided to finally live together. Still, this strange nagging feeling wouldn’t leave me be… weeks went by and I couldn’t figure out why this annoying feeling of sadness wouldn’t leave my side. Pretending all was well, I simply kept on going, and each day my spirits would get lower and lower and my heart grew heavier. I finally got to a point where I had to admit to myself that I was not happy. Not happy at all. But does this means then that I have failed? That I have failed in making my life a succes? That I have failed in choosing the right studies? That I have failed choosing the perfect career? That I have failed yet once again in choosing the right partner? “No no no… I am not a loser. I am a winner. Snap out of this state that makes no sense and get on with your life!”, were the words I would say to myself every morning… and I kept on going and going until I was completely depleted and burned out. Have you ever reached a point where there is absolutely no energy in your body? Have you ever reached a point where your body just shuts off and you have absolutely no control? Have you ever reached a point where all you can do is feeling so miserable that you cannot even shed a tear for yourself? There I was, a 29 year old woman, curled up like a baby in my bed with the blankets pulled over my head trying to figure out what the hell was wrong with me. I felt like a loser. I felt like a miserable worthless piece of flawed human being. I felt like I had no spine. I felt like a complete failure. Very quickly, everything spiraled down and I fell into a deep deep depression. 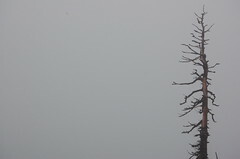 I withdrew myself from the outside world and I remember how loneliness and despair gathered around me like a thick cold fog. If I could travel back into the past, I would reach out to this young woman who was completely burned out, confused and in pain. 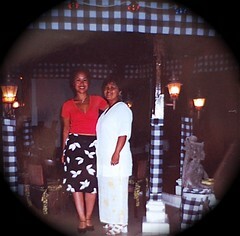 In July of 2001, my Mother brought me to the Island of Java, Indonesia. It was a wonderful opportunity for me to see the land where my Great Grandmothers and Great Grandfathers are from. 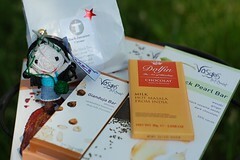 I was running on empty, my energy was thoroughly depleted, and off we went to Bali. 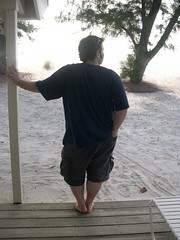 As soon as I set foot on that wonderful magical island, my whole being rejoiced. Bali’s creative energy and gentle spirituality peeled off this nasty layer of worry and distress that had been wrapped around me. 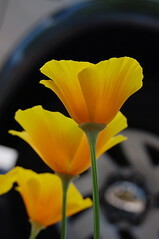 My energy bloomed beautifully, my head was finally turned to the bright sun and all I could do was SMILE. I met many interesting travelers, who all lead a life so differently than mine. They would tell me their adventurous stories and their hunger for making art and their need to be free spirits tickled me beyond belief. I adored them. I simply adored them… and I realized that I was too chicken and too square to lead a life as adventurous as theirs. Then one night, I find myself on a beach counting shooting stars with an American guy I met in a post office. Yes, you read that right… I met my husband in a post office somewhere on the island of Bali. How’s that romantic for ya? With this guy I had the most magical and fun time of my life for only one day and one night. He was to leave the island in just a couple of days after we hung out together and offered to stay longer to spend more time with me. Believe it or not, but I kindly declined. I strongly felt the need to be by myself and to explore Bali by myself for there was a lot for me to think about and to figure out. We parted ways the next day when he left for New York City. That was at the end of July of 2001. Little did I know back then, that this guy from New York City would marry me 4 years after we first met on the island of Bali. Little did I know back then, that my whole life would change from being square and locked into false securities into an adventurous traveling life. Little did I know back then, that meeting this man was the start of a journey of finding myself, and tapping into a marvelous creative and artistic energy. He did not come into my life, swept me off my feet and saved me. Absolutely no such a thing! What he did and has done ever since we met, is providing me with a good environment to explore myself and to let me find out myself to what greatness one is capable of. He lets me be ME by carefully nurturing my path so that I can flow in freedom. I will leave you today with a song covered by UB 40 and Lady Saw. The way Lady Saw breaks it down to UB 40’s lead singer Ali Campbell… I can identify! The way Lady Saw shakes her shoulders while she walks of the stage at the end of the song… I can identify! In the year of 2001, when I came to the realization that my life was not going the way I wanted it to go, I fell in a deep depression. I took action and quit my corporate business job, decided to also quit my Economics Studies, broke up with my boyfriend and distanced myself from my family and friends. “Nancy, you are embarking on a difficult journey in which you have a lot to overcome. Girl, you will have many rivers to cross, but please know that there are many bridges that will get you were you need to be. And a long and difficult journey it was, dear reader. And my co-worker was right. In the end it has been all worth it. Yes indeed I have crossed many rivers. I have even crossed that big huge pond when I left Amsterdam, the Netherlands, to come to the United States of America and marry the man I met on the Island of Bali. I have followed my heart and it brought me here where I am today. That sounds very romantic, and in many ways it is, but in also so many ways it is not. Leaving all that is known to you, to build a new life in a new country from scratch, is a huge river to cross. I am very happy to tell you that I finally have arrived at a place where Past, Present and Future all have come together. And at this very point, where Past, Present and Future are presented to me in a clear way, I have come to the realization that more than ever I feel comfortable in my own skin and am ready to show you more of myself. Feeling empowered because of YOU. 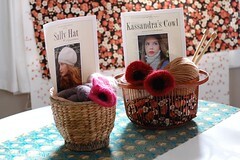 This blog is mainly about yarn and knitting, but dear reader, I have so much more to write about. I have so much more to say and I have so much more to show you. And I am ready to do that now, because I have arrived at this amazing energetic figurative place in my life, where everything makes perfect sense. 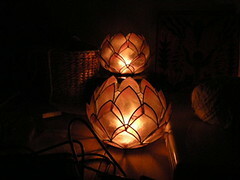 Thanks to YOU, I realize that what I have to say has meaning. Thanks to YOU, I realize that my words are heard and being read. Thanks to YOU, I realize that I am able to inspire . And that my dear reader, is a very empowering feeling. For giving me that, I thank you from the bottom of my heart. When I told you in my last post that my blog needs a different look, it forced me to really take a good look at myself. I won’t bug you with what came up after some self analysis. 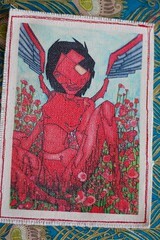 That I will share in a later post. What I will tell you right now is that I have been talking to a Web Developer and Web Desinger at the company Bottman Brothers, here in Portland. With their help I am building an “inspirational vehicle” and I cannot wait to take you to many many fun places, and to share with you many inspirational stories. I am SO READY to take my work to the next level, and look forward to do this together with YOU! I would like to make it known that any feedback that you have for me is GREATLY APPRECIATED. 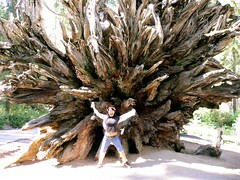 Positive as well as negative feedback from you I welcome with open arms. It will help me formulate in what model I will build this “inspirational vehicle”. So… give it to me STRAIGHT. I can handle it. But please don’t make me cry. Thanks for reading and until the next entry!!!! Over the past few weeks, while I was without knitting project, I have had a plenty of time to think about this blog I started in April 2007. And here I am, 2 years later, completely baffled that you all have visited my little blog over 68,000 times. Ever since I started, I never did anything to spruce up the look of this blog. I figured content would be much more important than anything else, and paid no attention to “looks”. 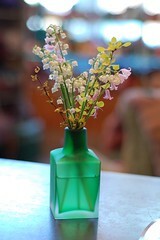 Methinks it is time for some sprucing up around here. Let me ponder about this one a bit more and I will get back to you! 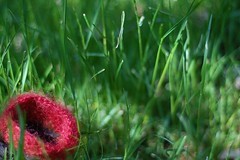 Although simply and small, this little poppy gives me so much joy knitting them. I just feel good making them and I have to refrain myself from screaming everytime I finish yet another one. If people see me knit a scarf, sweater or hat, all is fine. 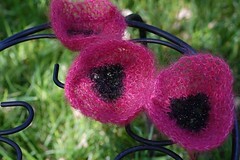 When they see me knit a poppy, eyebrows are raised and questions are asked. 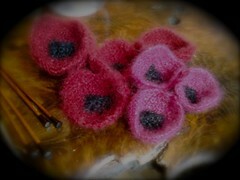 I am make my poppies for no particular reason. I make them because they make me happy. And I am going to knit a whole army of them and set them free in the world around me. 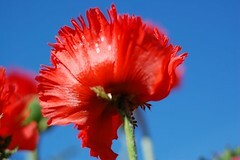 My brave little poppy soldiers will be spreading their cuteness and love all over the place! 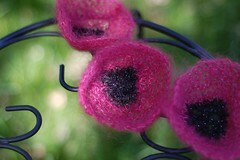 What will you use the poppies for? 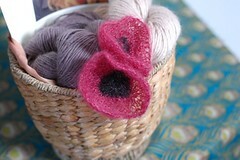 How about using the poppies for embellishment on a gift basket? Cute or what??? Sigh…so precious they are to me! 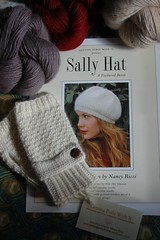 Thank you so much for purchasing the Sally Hat Pattern!!! You guys, I just want to give you a shout out for purchasing my Sally Hat Pattern at CloseKnit’s… So many of our costumers purchased it and I am so thankful for that. Thankyouthankyouthankyouthankyou!!! 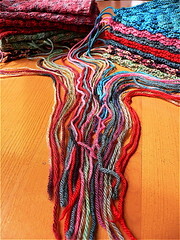 Just one more thing before I sign off… I guestblogged over at Rythm of the Needles! Was so much fun… Thanks so much for letting me be your guest, Joanne! Same here, glad to have met you on Twitter! You are currently browsing the Getting Purly With It blog archives for May, 2009.